Codarts is an open organization and believes it has a social responsibility to be transparently and purposefully accountable to its stakeholders. These features can be found in the statutes and regulations. In these, Codarts follows the principles of the HBO Corporate Governance. 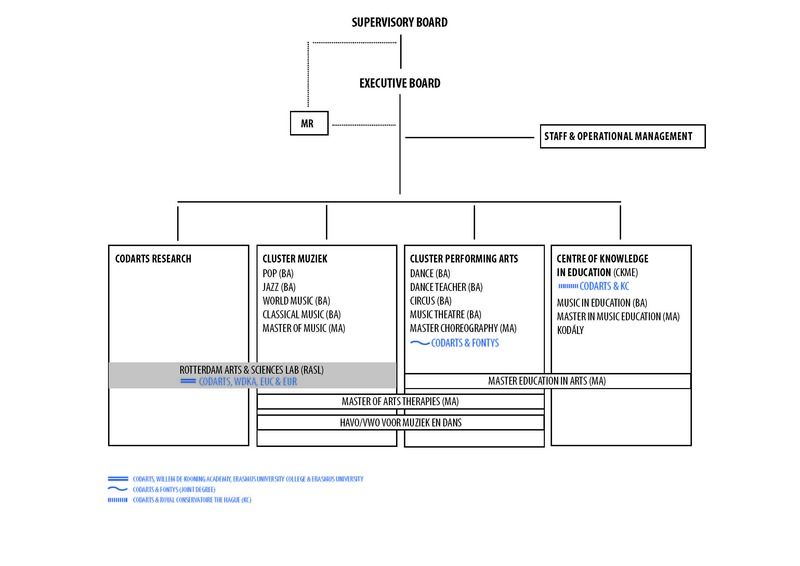 The Supervisory Board ensures that Codarts is managed adequately. In this, the Board concentrates on the realisation of the objectives of the university, the strategy and policy, the subsequent development of the result and the financial situation of Codarts. Besides, the Board considers it important to be sufficiently involved with the university. To this end, performances of the university are frequently attended and the Board is invited to special occasions to experience the atmosphere and the vitality of the institution. The Codarts Supervisory Board consists of four persons with broad management experience in the socio-economic field. The Executive Board is responsible for the realisation of the strategy and objectives of Codarts. The board determines the development plan and from there the frameworks within which the study programmes and support services implement their policies. Every year the Executive Board and the management establish agreements on the desired results in the annual plans of the various units. Based on the department annual reports and interim progress meetings, progress is monitored and agreements are made for the coming year. In this way, the board aims to increase focus on results. In addition, this method offers the different units a greater measure of freedom within the framework to decide how to achieve the agreed results. Email address of the Executive Board: cvb@codarts.nl.